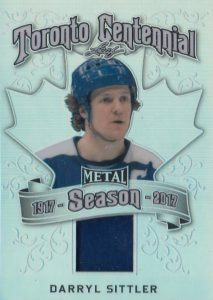 The 2016-17 Leaf Metal Hockey checklist mixes multiple eras of hockey collecting into one chromium set. The seven hits in each box can be either autographs or memorabilia cards, but most are of the signed variety. 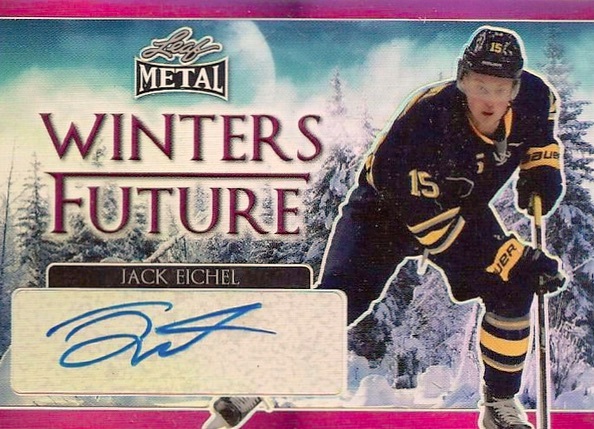 Presenting top prospects, former hockey legends and current NHL stars, 2016-17 Leaf Metal Hockey goes heavy on the signed cards and memorabilia pieces. Increasing the box hits, the format shifts slightly to include relics which weren't part of the all-autograph release in 2015-16. 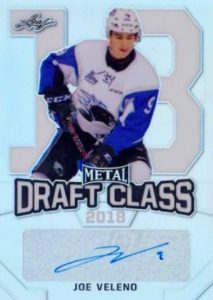 Offering tiered levels of Metal parallels, the Base Autograph set takes a forward-thinking approach with signatures from top young stars such as Nico Hischier and Nolan Patrick. 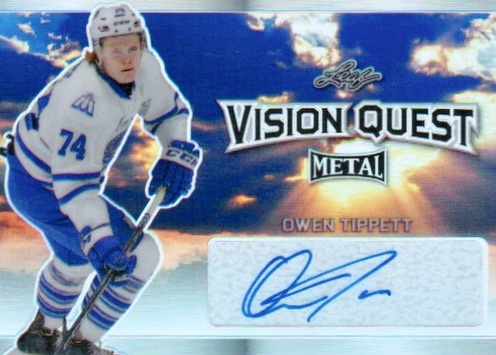 Other options concentrating on key NHL prospects are Draft Class Autograph, Vision Quest Autograph, and Winters Future Autograph inserts. 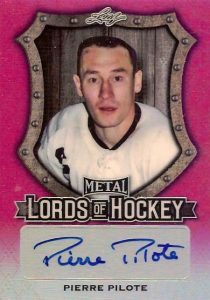 Switching to the past, Lords of Hockey Autograph cards cover all-time greats with a striking rivet-frame design. Also looking back, Toronto Centennial inserts present both Autographs and Relics featuring a leaf background. Of course, this set honors the 100-year anniversary of the Toronto Maple Leafs franchise. 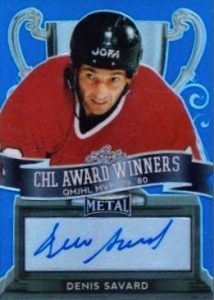 The CHL Awards Winners Autograph line documents the legendary standouts of the Canadian junior hockey league, including Lemieux, Lindros and Sakic. 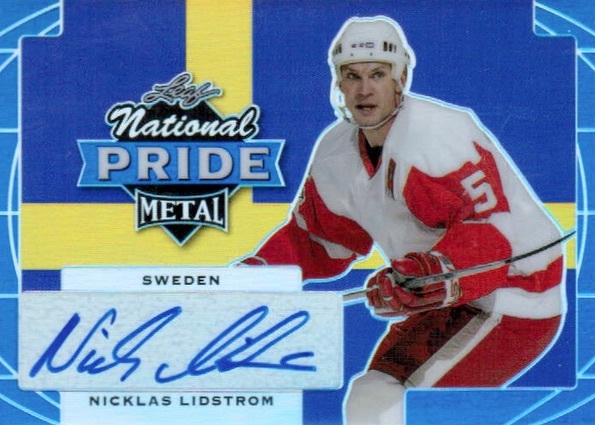 Putting a patriotic bow on the product, 2016-17 Leaf Metal Hockey also features National Pride Autograph cards that celebrate home countries for notable players. 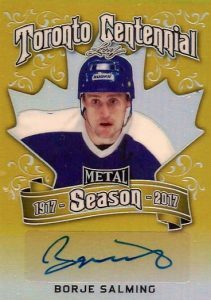 2016-17 Leaf Metal Hockey is a limited offering with 200 cases or 2,400 total boxes issued. 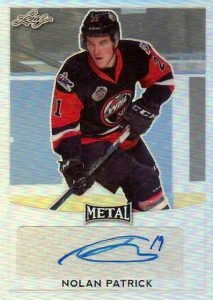 UPDATE - 3/21: 2016-17 Leaf Metal Hockey also features case guarantees. One box per case will be a "Hot Box" that yields only parallel autographs. In addition, collectors can find at least two autographs per case for Jack Eichel, Joe Veleno and Nolan Patrick. PARALLEL CARDS: Blue #/35 or less, Purple #/20 or less, Pink #/10 or less, Black #/7 or less, Green #/5 or less, Red #/3 or #/2, Gold 1/1, Super 1/1, Printing Plates 1/1. PARALLEL CARDS: Blue #/9 or less, Purple #/8 or less, Pink #/6 or less, Black #/5 or less, Green #/4 or less, Red #/3 or less, Gold 1/1, Super 1/1, Printing Plates 1/1. *Mario Lemieux base and all parallel cards are 1/1 with only a Black Printing Plate. He has 10 cards in total. PARALLEL CARDS: Blue #/15, Purple #/10, Pink #/7, Black #/5, Green #/3, Red #/2, Gold 1/1, Super 1/1, Printing Plates 1/1. 20 cards. Serial numbered #/10. Shop on eBay. PARALLEL CARDS: Blue #/8, Purple #/7, Pink #/5, Black #/4, Green #/3, Red #/2, Gold 1/1, Super 1/1, Printing Plates 1/1. 10 cards. Serial numbered #/20. Shop on eBay. PARALLEL CARDS: Blue #/10, Purple #/7, Pink #/5, Black #/4, Green #/3, Red #/2, Gold 1/1, Super 1/1, Printing Plates 1/1. PARALLEL CARDS: Blue #/8 or less, Purple #/7 or less, Pink #/5 or less, Black #/4 or less, Green #/3 or less, Red #/2 or 1/1, Gold 1/1, Super 1/1, Printing Plates 1/1. 16 cards. Print run is listed as 25 copies but base Silver is not numbered. Shop on eBay. 22 cards. Serial numbered #/25. Shop on eBay. 1 – Vision Quest cards – there are un-numbered versions – spreadsheet shows silver as 25 – not correct – to be correct -they are NOT numbered. and the mems list the autos…. example Bill Barilko , Dave Keon, Tim Horton and Turk Broda are in the auto part of the list – should be in mem only. to repeat – this is in the spreadsheet that is attached at the top link.